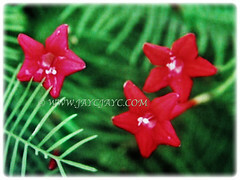 Cypress Vine or Hummingbird Vine is a magnificent climber with captivating star-shape flowers that comes in shades of scarlet red, pink, rose and white. Grow this Cardinal Creeper in your garden to attract butterflies and hummingbirds that are attracted to the brightly coloured blossoms. 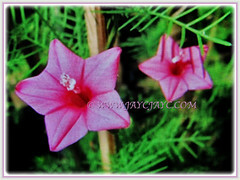 Botanical Name: Ipomoea quamoclit (syn. : Quamoclit vulgaris, Quamoclit pennata). 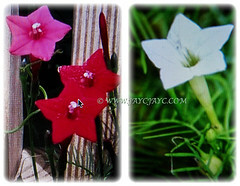 Common Names: Cypress Vine, Cardinal Creeper/Vine, Star Glory, Hummingbird Vine, Bunga Tali-tali in Malay. Etymology: The genus Ipomoea is from the Greek words, ips and homoios meaning resembling a worm, alluding to the twining habit of plants from this genus. The specific epithet quamoclit is derived from Greek name kuamos for dwarf kidney bean, a reference to the seedlings’ distinctively-shaped cotyledons. Origin: Native to Central America and tropical areas of South America. 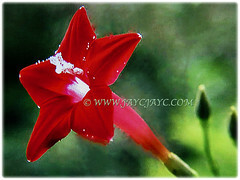 Features: Ipomoea quamoclit is from the genus, Ipomoea that consists of approximately 500-600 species. A slender and fast-growing herbaceous vine that reaches between 5-6 m in height by twining its flexible stems around vertical support. In the absence of a vertical support, the plant creeps indefinitely, rooting at nodes. Entire leaves, measuring 7 cm long by 4 cm wide are broadly elliptical to ovate in outline. They are deeply incised where each linear lobe is only 1 mm across, thus imparting a delicate lacy appearance to the foliage. 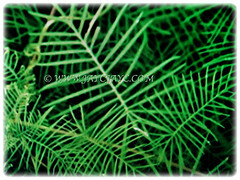 The evergreen and palmately lobed leaves are alternately arranged along the stem. 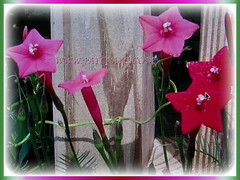 Bisexual flowers are trumpet-shaped with joined petals as well as exserted stamens and stigma. They are produced in small cymes of 1-3 flowers, which remain open during the day and close by late afternoon or evening. Blooms come in varying shades of scarlet red, pink, rose and white. Relatively free-blooming and visited by nectar-seeking ants, hummingbirds and butterflies. 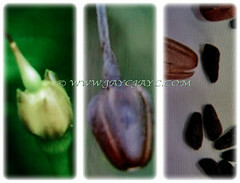 Eventually, the flowers will be followed by simple fruits and dehiscent dry capsules containing a few glossy and black seeds. 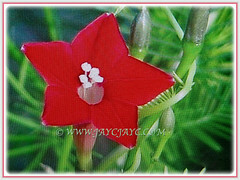 Culture (Care): Ipomoea quamoclit or Cardinal Creeper can be easily grown with minimum care. Others: Deadhead the spent blooms of this beautiful vine to promote more flowers. Provide the vine with a support such as a trellis or fence to allow it to climb. Feed once fortnightly with a high phosphorus fertiliser for flowering plants at ½ strength. 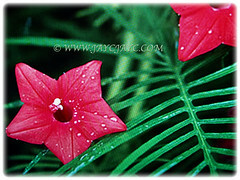 Ipomoea quamoclit or Cardinal Creeper are annual plants that will succumb to frost or freeze even though they are perennials in frost-free regions of zones 10-11. In zones 6-9, they may return yearly from seeds dropped by previous season’s plants. Sow seeds that take 5-10 days to germinate directly into your flower bed after all danger of frost has past. Feed the plant once monthly with a high phosphorus fertiliser at ½ strength in early spring to promote flowering throughout summer and fall. Propagation: Easily propagated from seeds that will germinate between 5-10 days. Soak the seeds overnight before planting to help germination. 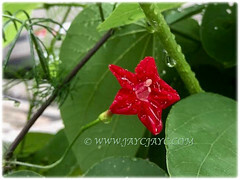 Usage: Ipomoea quamoclit or Cardinal Creeper with its colourful flowers and beautiful foliage will be excellent when trained to climb a trellis, fence or large tree to display its spectacular beauty. Suitable for container gardening or planted in the ground. It’ll make a great accent specimen in any garden. The plant is considered cooling and purgative that is used in cancer and brest pain. Its pounded leaves are applied to bleeding piles and as a plaster to carbuncles.